Sonam Kapoor and Anand Ahuja are all set for their big fat wedding and we are so glad. The soon-to-be-married couple have been rumoured to be dating for over two years now and have often occupied the top spots on Twitter trends for being spotted hanging out together and attending family events together. Preparations are currently on for the Sonam Kapoor-Anand Ahuja wedding, which is to be held in Mumbai on May 8. The day wedding will be preceded by a mehendi ceremony on May 7 and will be followed by a party in the evening on the saadi day. So ahead of Sonam Kapoor and Anand Ahuja di wedding, here's a look at their romance over the years. Anand Ahuja was initially identified as Sonam's rumoured boyfriend when he was spotted attending the roka ceremony of the actress' cousin Akshay Marwah in October 2016. A photo of the Kapoors with Anand in tow, shared by Sonam's sister Rhea, did crazy rounds on social media as the Internet thought they had identified Sonam's boyfriend. Ahead of that, Sonam and Anand were spotted together at Akshay Kumar's party for Will Smith in August. The following year, Anand Ahuja joined the birthday celebrations of Sonam's mother Sunita Kapoor in London. By that time, Anand had also started making occasional appearances on Sonam's Instagram, leading to speculation about the rumoured couple but neither Sonam or Anand addressed the rumours. What A Wonderful Way To Celebrate Mothers Day! Later that year, Anand Ahuja was one of the loudest of those who cheered for Sonam Kapoor at the National Awards held in May last year. Anand was seated beside Sonam at the National Awards, who was also accompanied by her parents - father Anil Kapoor and mom Sunita. Anand then set major relationship goals as he posted this adorable photo of Sonam from the National Awards with the caption: "My fave." Sonam had won her first ever National Award (Special Mention) for her role in Neerja. Anand has also always been an admitted admirer of Sonam's work and fashion sense. Take this Cannes-special post for example. Sonam Kapoor, a bona-fide fashionista, is also often spotted wearing Bhane - the label owned by Anand Ahuja. In July 2017, Sonam delighted Anand with the "best birthday surprise" ever! The duo were on a staycation in New York. Not just from the Big Apple but sometime around then, the duo started filling up their Instagram with entries also from London and hometown Mumbai - something which they maintain till date. On New Year's, Sonam and Anand's loved-up photos and videos from Paris had sent the Internet into a meltdown. 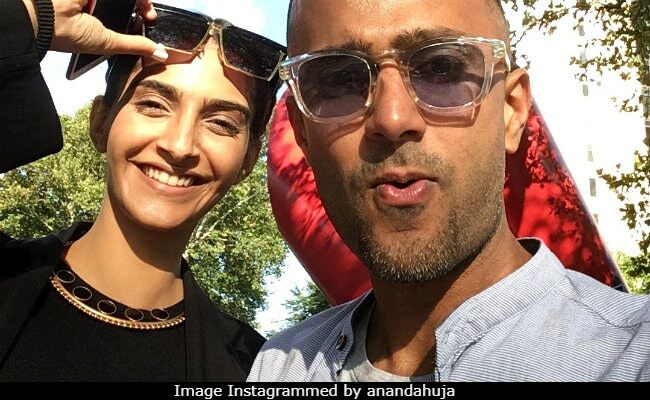 On Valentine's Day this year, Anand Ahuja's comment on Sonam's enigmatic post confirmed a certain section of the Internet about the two being much in love. "Happy Valentine's Day. Everyone deserves to love and be loved," Sonam had captioned the photo to which Anand replied: "There's love and there's fear. You can't have one when you have the other. I'll never have fear again because of you." In the recent past, Anand Ahuja was also Sonam's plus one at the actress'cousin Mohit Marwah's wedding in Dubai. After Sridevi's tragic end in February this year, Anand was by Sonam and her family's side and was spotted accompanying Sonam to Sridevi's funeral. Photos of Sonam Kapoor and Anand Ahuja's wedding card surfaced on social media on Wednesday and reveal the details of the two-day wedding. The invite includes three separate cards for the three separate functions to be held over two days. The couple have reportedly opted for e-invites to avoid wastage of paper. On the work front, this will be a very busy month for Sonam, who will walk the red carpet at the Cannes Film Festival on May 14 and May 15 and is also currently busy with the promotional duties of Veere Di Wedding which releases on June 1. All said and done, we can't wait to congratulate Sonam Kapoor and Anand Ahuja!